QSC has introduced new Q-SYS Networking Solutions, including Q-SYS NS Series network switches and additional networking resources designed to help integrators simplify installation and increase profitability of Q-SYS-based networked audio, video, and control (AV&C) systems. The NS Series is a range of enterprise-grade, fully managed 1/10GbE network switches that are preconfigured to meet the performance requirements of the Q-SYS Platform and associated third-party networking technologies, and to expedite deployment of Q-SYS on a local network. 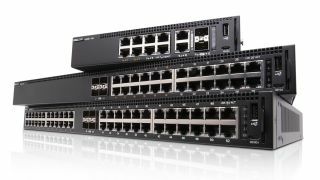 Available in eight-, 24-, and 48-port models, these Dell EMC network switches provide real-time transport of Q-SYS AV&C, as well as AES67 and Dante audio streams simultaneously within the same VLAN, all without the need to manually configure the network switch or endpoints. Independently tested and verified by the University of New Hampshire InterOperability Laboratory (UNH-IOL), the NS Series is a plug-and-play solution that enables faster, more reliable system deployment and ensures support for the entire Q-SYS ecosystem, including future networked Q-SYS processors and peripherals.